Restaurants and coffee houses of Amsterdam usually strike tourists by their diversity. This city will be surely appreciated by admirers of gastronomic tourism. Café Pacifico Restaurant serves the best Mexican cuisine in the city. It is worth noting that there are not many restaurants of this gastronomic direction in Amsterdam. Tacos, meat with spicy sauces, chicken with rice and wonderful desserts - this restaurant is simply perfect for family rest. Manzano restaurant is located in one of historical buildings of the city. Here you will find home-made cheese of highest quality and widest choice of meat dishes. The restaurant also offers a large choice of fine wine. Ocho restaurant will become the favorite place of rest for lovers of exotic cuisine and grilled food. Roasted chicken with vegetables, pork in honey sauce, salads and exotic drinks - it's just a small part of dishes available in Ocho. The opening of Sal Meijer restaurant took place in 1957. This restaurant offers visitors to taste kosher kitchen. Here visitors will find amazingly tasty sandwiches with smoked meat, fish patties, stew with vegetables, homemade sausages and large choice of soups - the restaurant's menu is very diverse. Reasonable prices are another advantage of this place. Have you ever tried African cuisine? If yes, you will surely want to try a large choice of meat and vegetable dishes, as well as exotic desserts. If no, then simply visit Addis Ababa restaurant and enjoy new gastronomic experiences. African wine and beer will become an excellent addition to dishes. The quality of drinks is really high, so they will be surely appreciated by the admirers of these beverages. The restaurant's interior also deserves the highest praise: national rugs, unusual glassware and paintings depicting African motifs give Addis Ababa its unique charm. During various gastronomic tours, guests of Amsterdam are welcome to try the most popular national dishes. Of course, travelers can enjoy local food independently by simply visiting the city’s restaurants and cafes. Croquettes with various fillings have long become one of the most popular national dishes. Virtually all dining venues offer this delight. It is possible to find croquettes in large supermarkets, small stalls with street food, and in any restaurant specializing in the national cuisine. As a rule, croquettes are cooked from different types of meat and served with a selection of sauces. Sáte is a no less meat dish. This dish looks like small meat skewers with vegetables. It is believed that this dish became popular in the period when the Netherlands had a large colony in Indonesia. The national cuisine of the latter contains many skewers with beef, pork, or chicken. However, skewers in Indonesia are traditionally served with the peanut sauce. Bami Goreng is one more dish that is present in the vast majority of Amsterdam restaurants specializing in the national cuisine. This dish is made of noodles cooked with various meat and vegetables in a wok. Numerous restaurants offer this dish in accordance with various signature recipes. Chicken, beans, and soy sprouts remain the most frequently used ingredients offered with noodles. This delicious dish also has Indonesian roots, so all fans of oriental cuisine will be simply in love with it. Sweet tooth travelers also will not be disappointed with their stay in Amsterdam. They will genuinely enjoy Oliebollen dessert that is traditionally served in winter. Small Oliebollen donuts have been cooked in accordance with the unchanged recipe starting from the 17th century. The round shaped donuts are cooked in quite an interesting way – local chefs now use special ice cream spoons to make the ideal shape. Raisins are an essential part of the dough. Sometimes, these donuts have apple filling. They are traditionally served with sugar powder. The recipe is considered a “winter” one because Oliebollen are traditionally available before Christmas. However, tourists can also try Oliebollen during various national holidays, at fair trades and festivals. Amsterdam’s traditional national dishes are simple, hearty, and affordable. Boerenkool Stamppot is a great example of that. It is traditional mash with cabbage that is usually offered with meat or sausages. Absolutely every national cuisine restaurant has a selection of affordable dishes, and Boerenkool Stamppot is one of them. It is also often sold in street food stalls and supermarkets. This guide to cuisine and restauraunt in Amsterdam is protected by the copyright law. You can re-publish this content with mandatory attribution: direct and active hyperlink to www.orangesmile.com. Travel notes on best cuisine and restaurants of Amsterdam (Netherlands) on OrangeSmile.com. 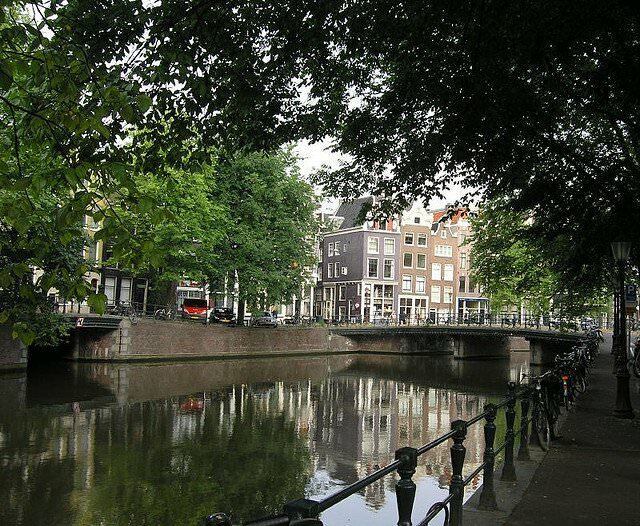 Famous recipes and traditional dishes and courses in Amsterdam restaurants. Where to eat - our recommendations on popular places in Amsterdam, where you can taste delicious meal and also spend a good time with your friends.